Serving the Replacement Window and Door Needs of the Entire Ballwin Area. For quality, performance and value in replacement windows Ballwin area residents trust their homes to the professionals of Renewal by Andersen® of Ballwin. Our replacement windows and doors offer advantages that no other windows or doors can deliver. All of our windows and doors feature the advanced technology of Renewal by Andersen’s exclusive Fibrex® frame and sash material. Fibrex lasts longer, looks better and performs better than wood, vinyl or aluminum. Combining the natural look of wood, the low maintenance features of vinyl, and the durability of aluminum, Fibrex never requires painting and will not crack, pit, corrode, or rot. The same great quality that goes in Renewal by Andersen windows can be found in our rugged, dependable and attractive sliding patio doors and French doors. You get an expansive glass area for maximum illumination and visibility, but with superior energy efficiency and thermal performance. Get a Free Estimate on Replacement Windows in Ballwin. 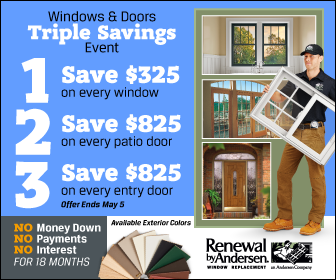 Trust the certified professionals of Renewal by Andersen® of Ballwin with all of your window and doors needs. Call today at (281) 378-6000 for a FREE in-home consultation and estimate.